Cat Adopts and Nurses Baby Ducklings! Oskar the Blind Cat Opens a Closed Door! When two farmers in Ireland found three of their ducklings missing, they thought the worst. But then they did a little searching and found them nestled up to the neighborhood cat, trying to nurse alongside her kittens! They originally assumed "The White Cat," as she is called, was to blame for the missing duckies... but they quickly realized she was just protecting them and making sure the had enough to eat. Look how cute and happy she is with her new birdie babies! P.S. Unfortunately, I am reading some reports that duckies can't actually nurse, so they're just kind of copying what the kittens are doing -- but it still makes for a cute video! Slides are confounding things. No matter how fast these kitties try to run or how quickly their little paws pitter-patter away, they just can't get up any higher on this silly slide! Who needs a treadmill when you have kittens on a slide? BONUS CUTE: Here are some baby pandas on a slide! Oskar has been blind since birth, but that doesn't stop him from being amazing and super smart. He even knows how to use door knobs to open closed doors! His other senses are extra good, so he is able to use them to do what most of us would think would be impossible! He wanted to get in the other room... so he figured out just how to open the door to do it! BONUS CUTE: Watch as Oskar the blind cat plays fetch! Sigh. Being a cat is such a tough job. The "authorities" are constantly either thwarting brilliant plans or ignoring completely reasonable requests. BONUS CUTE: Here's the diary of a cute kitten. Thanks to Cute's fabulous friend, Gretchen H., for sharing this sad cat diary video with us today! Two Cats Tuesday: Smooch Collages of Pimp and Moo! Happy Two Cats Tuesday, Cuteheads! Today there are a bunch of pictures of Pimp and Moo -- a collage of each of them being extra super cute! We were all relaxing on the couch a few days ago and I happened to have my phone handy nearby... and so I caught some of their cuteness! I also caught some smooches, of course. How could you not smooch these boys? I am much more lion-like than Moo. And I don't push the smooches away... I act indifferent, and maybe a little annoyed. We hope everyone had a good holiday weekend! Lots of cute coming up this week! Ah, if it were only this easy to de-fur every cat! Bobo the cat loves to be vacuumed, especially his belly. He gets his face vacuumed, his little feet, his tummy... everything! Sure beats having to lint roll the couch or the bed all the time! Vacuum in my house means one cat in the middle of the bed, as far from where it could possibly go, and the other under the bed, same distance logic. BONUS CUTES: This silly cat loves to lick the vacuum cleaner attachment and this one absolutely hates the attachment. P.S. Happy Memorial Day, Cuteheads! Hope everyone has a safe and happy holiday! Bonedigger the big lion needs his teeth cleaned, and his trusty dachshund dentist, Milo, is there at the ready to help get his teeth squeaky clean! We all know how important your smile is, and even more important the bigger it is! I wonder how Milo learned to do this? I think he's a brave dog! P.S. Today is another transport day! We have two kitties traveling through Florida on their way to their forever homes! I'm using hashtag #HopperSimba on Twitter to share along the way. Simba is heading to Tampa today. His new mom is in Georgia, and he is getting a ride to Georgia from tomorrow. He is going to sleep over tonight at Cutehead Melissa W.'s house until tomorrow! 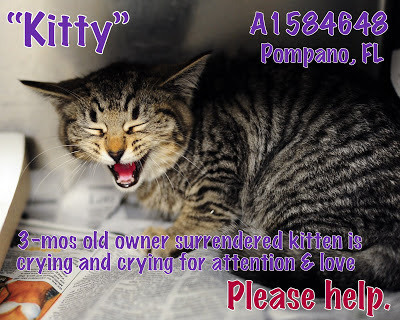 Simba was actually named Kitty at the shelter, and he was miserable. We also thought he was a "she" at first, and her name was going to be Nala. But then... surprise! It's a boy! He is going to a wonderful forever home. Simba's sad shelter picture. His name was Kitty at the time. Of course we had to help! Hopper is also from animal control here in Pompano, FL. He was a staff favorite and somehow was still there after two months (a miracle that he survived there that long, and crazy that no one fell in love with him in that time!). But Cutehead Kristie W. in Tallahassee saw his picture when I shared it on Facebook and fell in love! And one thing led to another... and he's on the way to her! Hopper is heading to Live Oak, FL today to camp out with Cutehead Dusti M. until next Saturday, and then Kristie will pick him up from there next weekend! Hopper, looking quite the gentleman at the shelter. Two more kitty lives saved! 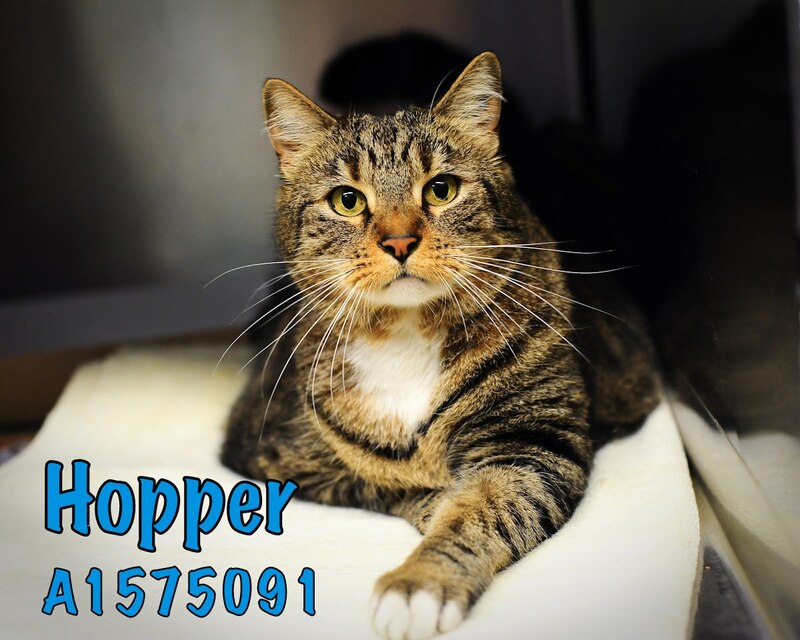 Thanks to today's Cutehead drivers, Carie P. (who fostered Hopper here! ), Pam C., Linda L. and Diane L.! And thanks to Simba's awesome foster daddy, Kyle S., who fell in love with him, like I'm sure his new mom will. And, OF COURSE, huge thanks to our partner in rescue, Good Karma Pet Rescue, for getting them all vetted and out of the shelter to travel!